Razor bumps, sometimes referred to as shaving pimples, are an unsightly side effect of shaving that we can all do with less of. If you’re into fun facts then it’s neat to know that people with curly hair are more likely to get razor bumps than people with straight hair. Sorry curly haired people. Getting rid of razor bumps is one thing but we should also talk about preventing them as well so we’ll cover both in this article. Razor bumps usually result from shaving hair off at angles which leaves them with sharp points. Then these little spears get bent by the razor on subsequent passes and stab into the skin. Not liking being stabbed our skin freaks out and breaks out in little red bumps called pseudofolliculitis barbae. 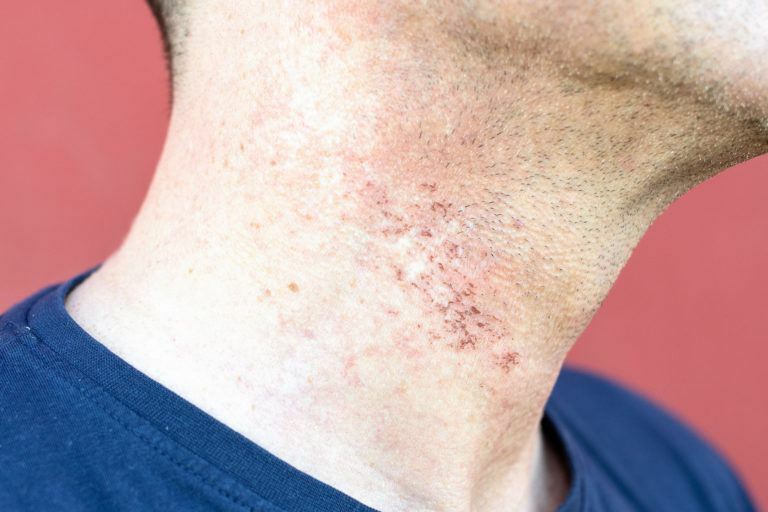 There’s also a more severe version of razor bumps called Barber’s Rash, where the skin gets infected by Staph bacteria that live in our noses! Yeah, weird. Don’t shave, or shave less. The best thing to do to avoid razor bumps is not shave. Sounds simple enough. “But I don’t want to look like a hobo!” You might be saying and that’s fair. Some of us with severely sensitive skin however can limit the amount of close shaving we do to reduce razor bumps. Only shaving once every few days and keeping things down with a beard trimmer between razor close shaves will help immensely. If you have extremely light hair you can sometimes get away with only using a beard trimmer since your stubble won’t look as scraggly. If you must shave then you need to prep your skin before you shave. Have you ever watched the old black and white movies where someone is sitting at a barbers with a towel wrapped around their face? What they were doing there is softening the facial hair with hot water which makes the shave more pleasant and less likely to leave razor bumps. You can do this at home by getting a washcloth wet with water as hot as you can stand it and pressing against the skin you with to shave. Keep it wet and hot for about five minutes for the best effect. You can also take a long hot shower before shaving or a nice soak in the tub. The tub is waaay more relaxing. Prepping your face is a good start but now let’s talk about proper shaving techniques. When you’re done shaving disinfect your razor with rubbing alcohol to kill bacteria. The last thing you want is to shave your face with a germ infested razor. Wipe the razor down with a cotton ball soaked in rubbing alcohol after use. If you’re really into getting a close shave daily then consider upgrading to a quality razor. The fancy multi-blade razors seem like they’re the best option but in reality they’re razor bump factories. Each pass has that many sharp edges dragged across your face and increases the chance for irritation. The old school ‘safety razors’ as they’re called are expensive but worth it. These have a single high quality blade that gives you a close shave with less irritation if done right. There’s an art to using these safely so you’ll want to be careful and read the directions before use. Unlike disposable razors they don’t have the blades aligned at angles with guards so there’s a real chance of slicing yourself wide open if you do things wrong. Even though you took all the precautions you still ended up with razor bumps. Bummer. Sadly the best thing to rid yourself of razor bumps is time. You’re skin needs to heal from being stabbed repeatedly with your hair spears. There are a few products that help a little. Scary, right? Most razor bump treatment products are simply acids that eat away at the bumps and free up the hairs causing them. Many of these are similar or identical to acne treatments that use salicylic acid as a primary ingredient so they’ll do in a pinch. Described as an exfoliating gel for ingrown hair, Baxter of California manufactures a fairly popular razor bump treatment product called “Razor Bump Relief.” As most razor bump products do, Razor Bump Relief uses a mixture of salicylic acid with an exclusive blend of witch hazel to help dissolve the skin above the ingrown hair, and allow the hair follicle to grow hair normally. You can find good cleanser pads from Dickinson’s at Amazon. In addition to the coolest sounding skin products ever, Witch Hazel also helps ease your skin’s discomfort but also helps reduce redness and swelling. You can get it in huge generic bottles and apply it with a cotton ball. A must if you are a regular victim of razor burn or skin irritation in general. A more medicated approach, hydrocortisone creams are extremely common for treating bug bites, rashes and other skin conditions. It essentially jump starts your skin’s healing powers like your some mutant superhero and helps clear up the bumps. Always a good choice as long as you’re getting something with some actual useful ingredients in it. Stay away from cheap stuff that is basically just perfumes and alcohol. Good aftershave should have things like witch hazel, astringents or vitamins in it. Aftershave will help prevent the formation of razor bumps by keeping your skin healthy and strengthening it for future shavings. If you’re careful about being Green, these might be the natural razor bump treatments for you. You can find North Woods After Shave at Amazon. Okay, so this isn’t really a treatment but more of a prevention by avoidance. A beard keeps the skin’s natural oils from being stripped away by washing, shaving and sunlight. A properly groomed and washed beard will keep the underlying skin healthy and since you’re not shaving you won’t get razor bumps!